Over 150 young people from across the Diocese of East Anglia enjoyed the Ignite Youth Festival over the weekend (May 5-6) camping at the Sacred Heart School in Swaffham. Groups from Norwich, Cambridge, Peterborough, Ipswich, Peterborough, Bury St Edmunds, Swaffham and elsewhere were offered a packed-programme of activities, speakers and entertainment. 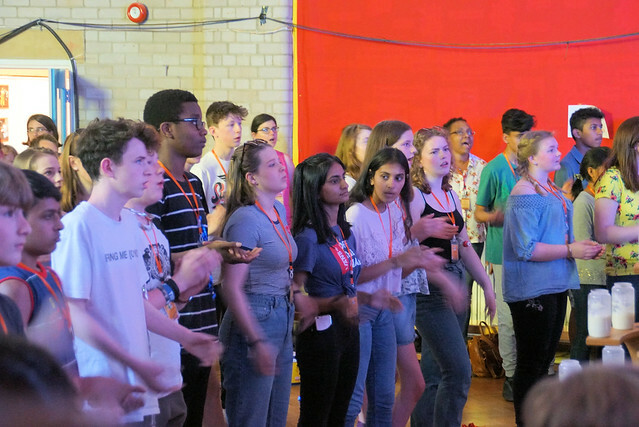 On Saturday, the Youth for Christ band from St Johns Cathedral in Norwich played worship music while Clive Sheridan and Cat Williams from the Ignite team got everyone into the festival mood with some games. They then interviewed Gabby and Paige(pictured right) who featured, along with Sisters from the Daughters of Diving Charity in Swaffham, in the recent Channel 4 documentary Bad Habits – Holy Orders. Gabby said: The nuns taught us a lot about ourselves and gave us a chance to think as well. I learnt not to do things just to impress other people I had been living in a world where I just wanted to impress others, which you should never do. When you mobile phone is taken away you learn a lot more about yourself. Paige said: The time at the convent taught me not to be as selfish as I used to be. It has made me realise that there is much more to the world than just the screen of your mobile phone. Fr Luke Goymour, Cat and Ciaran Losasso spoke about Adoration and the Sacrament of Reconciliation (Confession) and then there was a quiet time of Adoration of the Blessed Sacrament and the opportunity for the young people to go to confession – which many of them did. The evening was rounded off by a dance session from DJ Breaker. On Sunday, Sr Theresa Weight from the Community of Our Lady of Walsingham, mime artist Steve Murray and evangelist Derek Williams from Walsingham all spoke and Bishop Alan celebrated Mass. There were workshops including: giant Jenga, Crazy Olympics, mime, Nerf battle and Rosary bead making as well as more thoughtful ones such as: Made for Love, Ask Anything and What are you doing with your life? There was also some late-night entertainment from Norwich band Mengelmoes. Reflecting on the event, Diocesan Youth Service director, Hamish MacQueen, said: The young people really engaged with the activities. The focus, as always, is to help theme grow in their relationship with Jesus. The theme is Be Not Afraid as spoken by the angel Gabriel to Mary, because Pope Francis has chosen that theme for World Youth Day this year. The Adoration and Confession is a chance for the young people to spend some time with Jesus face-to-face. There is lot of noisy stuff going on but this is a time of quiet just to bring people into an atmosphere where they can be more aware of Gods presence and aware of his love in the Sacrament of Reconciliation very real ways for our young people to encounter Jesus. We have been able to put on the event this year because we have a great team of over 20 people which enables us to put on a much bigger and more professional event so thank you to them all,said Hamish. On Bank Holiday Monday a large group of young people who had attended the festival walked around five miles to join the Diocesan pilgrimage at Walsingham.